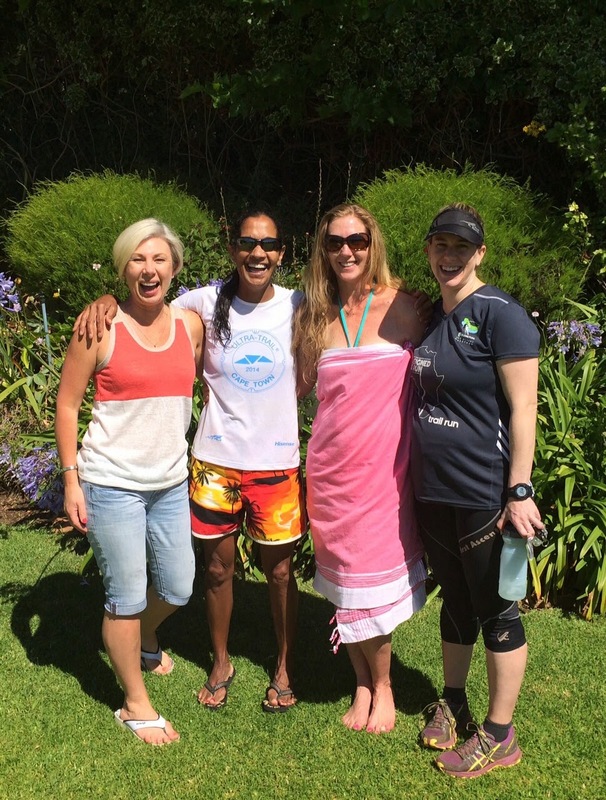 The annual end-of-year Cecelia forest and Kirstenbosch run was held on Saturday 13 December. Thanks to the Granelli's for hosting the picnic after the run. We look forward to seeing everyone back next year on 10 January 2015. Please keep reading the blog for the details of our next run. 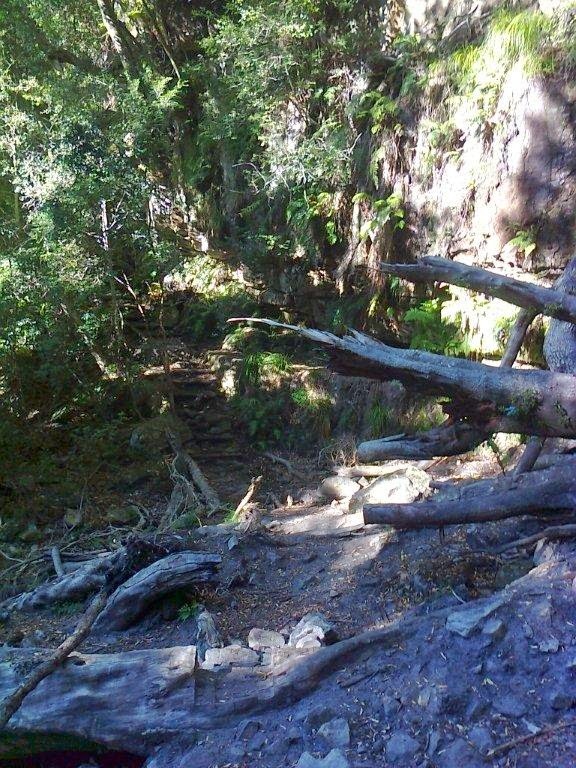 Old, fallen trees that become part of the path and make trail running an adventure. 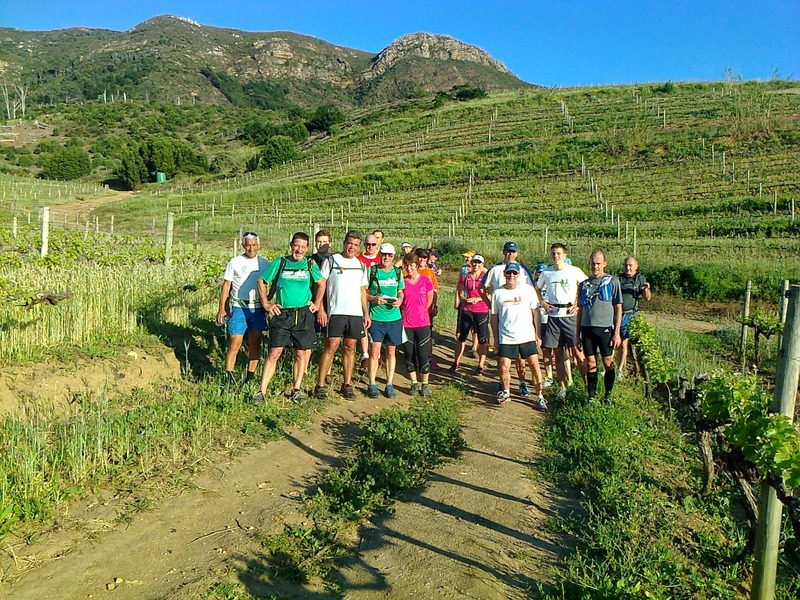 Being the last run of the year, not many kept time, but the Main group did about 13 km and the Recovery group turned at Nursery Ravine to complete 11.2 km in about 2 h.
Saturday's run was the first anti-clockwise run of the inaugural Hout Bay/Llandudno/ Oude Schip run on 20 September. The route started with a short uphill on the brick pave road, then down to the beach and we proceeded onto Llandudno. 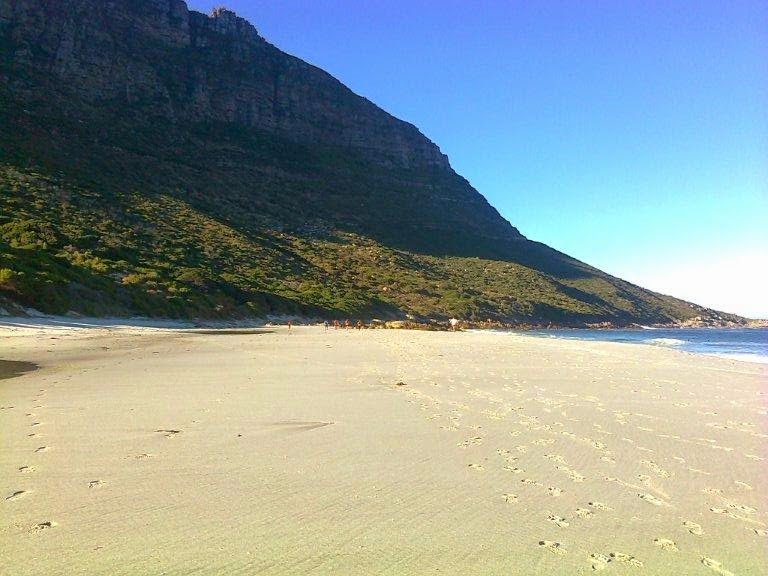 We then backtracked to Sandy Bay and headed southwards along the shoreline path crossing the isthmus to Oude Schip. The first climb came on gabion steps to Rocket (Mitchells) Road, before taking the left fork at the stone cairn. This was a shorter run than usual, with the main group completing about 9.3 km in 1h 30min. Early morning stretch along the beach. 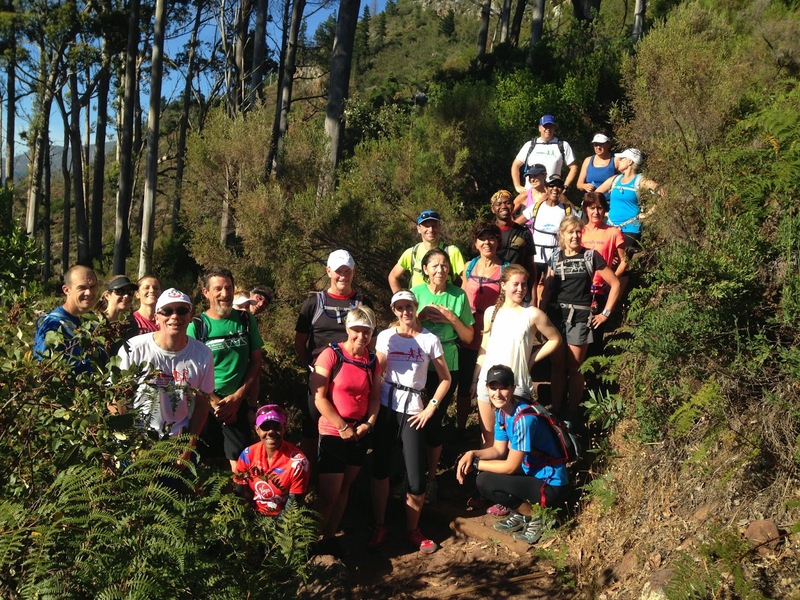 A smaller group turned out this weekend for the Cape Point run. We met at the Olifantsbos parking on the west side of the point. However, before arriving at the start, we were greeted by a herd of bontebok and an ostrich. 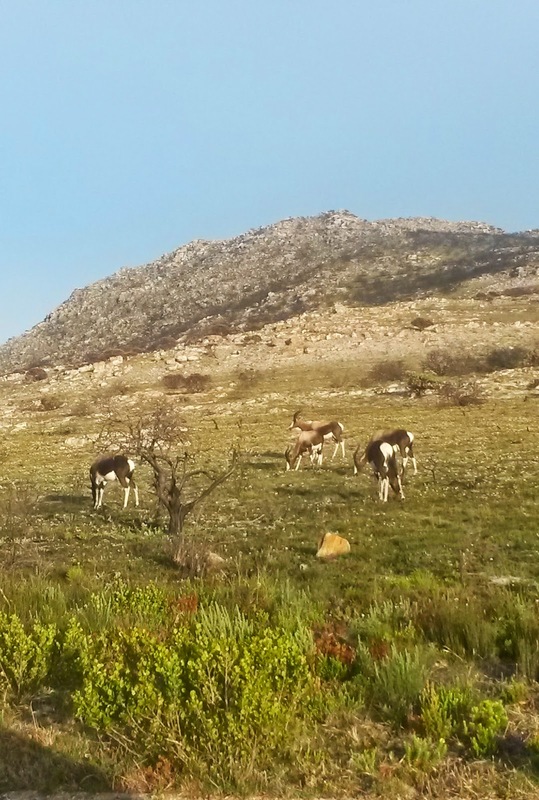 A herd of bontebok grazing. All groups set out from the Olifantsbos parking towards the beach and to the shipwrecks. 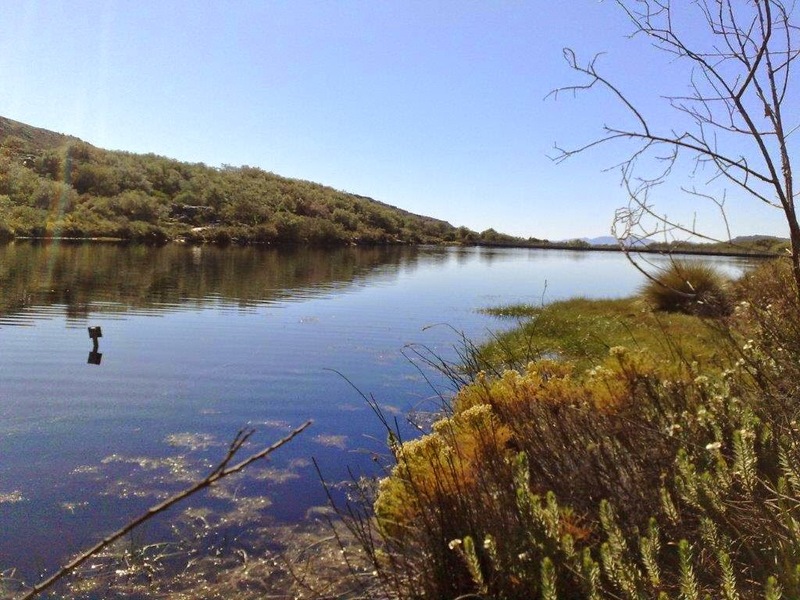 After the shipwrecks, we headed inland and a slight up towards Sirkel vlei. From there, we headed back to the start along the Mimites ridge, a total of 10.3 km. The main group complete the run in 1h 30min, the recovery in just under 2h and the walking group in just under 2h 30min. Piece of a whale carcass. A large turn out for a great summery Cape Town day. 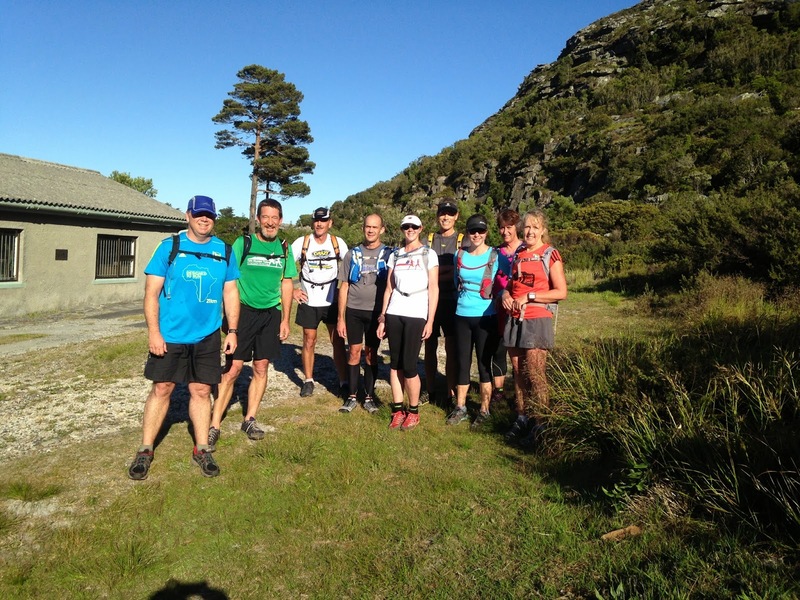 More than 20 runners in the Main group and fewer in the Recovery and Walking group, set out from the Tokai Arboretum at 06:30. All groups set off up the shortcuts to Level 5. 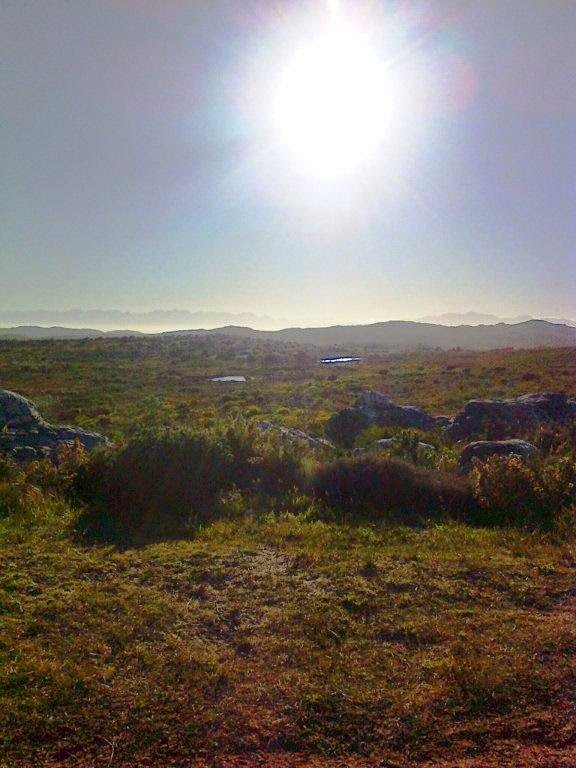 At the jeep track, the Main and Recovery groups turned left towards Silvermine and into the mountain bike parking area. 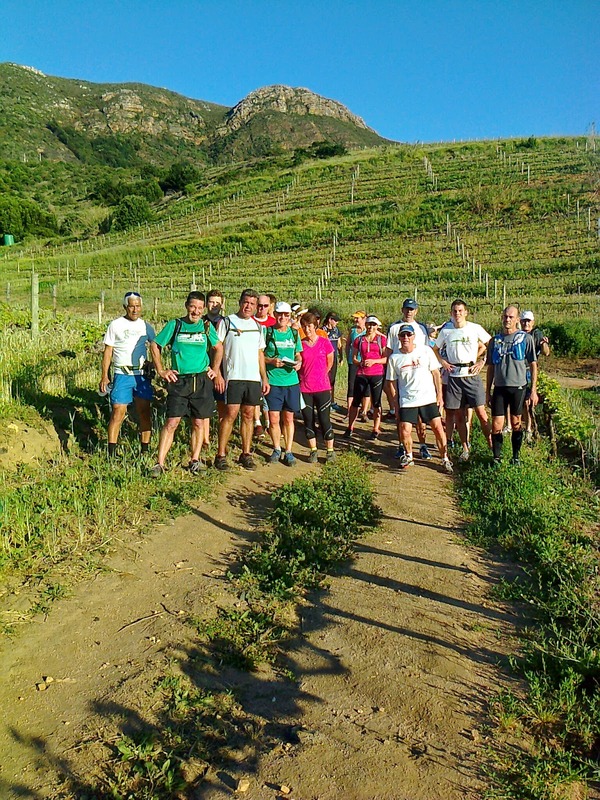 Both groups continued along Steenberg Ridge towards Blackburn Ravine. 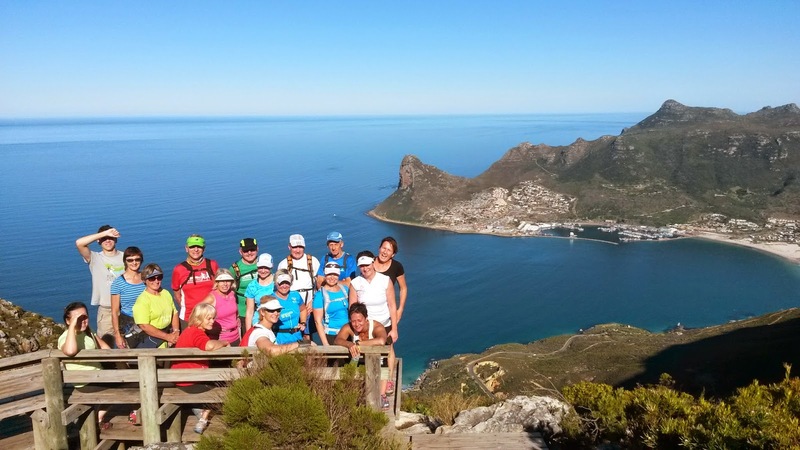 The Main group ran further to the HoutBay view point and then back towards the fire lookout. 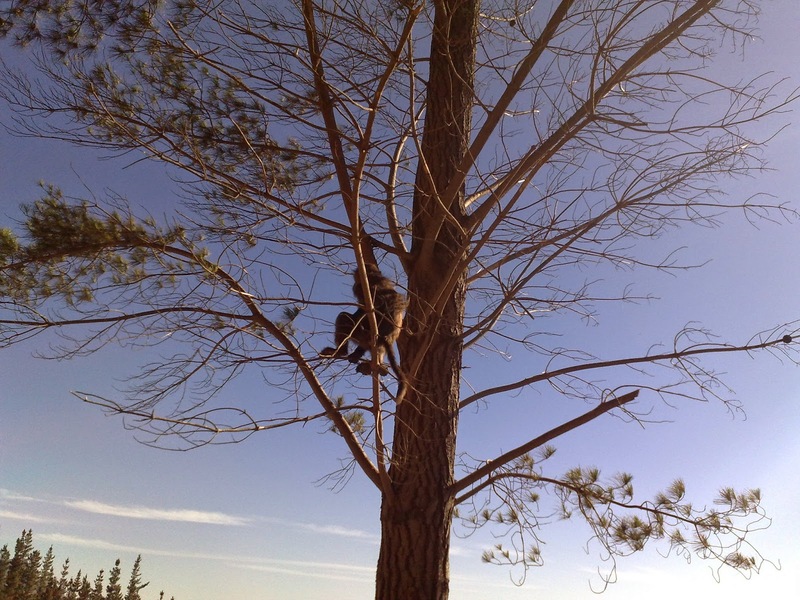 The Recovery group went only as far as the fire lookout before both groups headed back towards the start. The Walking group went right at the top of Level 5 and heading north before zigzagging back down to the start. 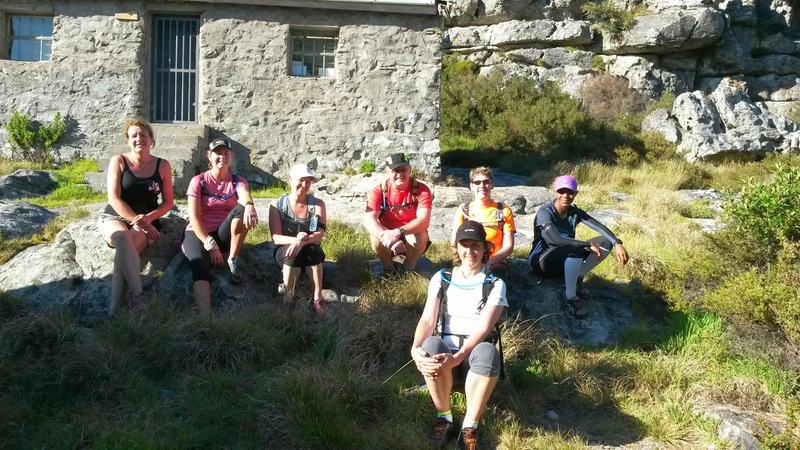 The Main group completed 15 km in 2 h, the Recovery group 11.8 km in 5 h 45 min, and the Walking group 8 km in just over 2 h.
Small group turned out on Saturday to run the Silvermine north-west route. Heavy downpours and snow on the higher mountains in the Western Cape, resulted in a chilly breeze for the run. All groups started at the car park, the Walking group did a walk/run loop along the gravel paths, and the Main and Recovery groups set off along the River walk. From the River walk the groups went through the mountain bike parking area, where the Recovery group took the lower gravel path and the Main group went up Steenberg Ridge. 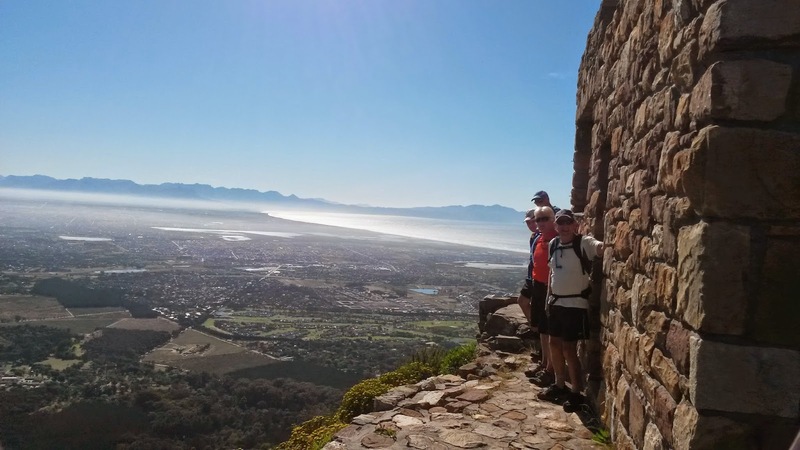 From Steenberg ridge, the The Main group headed towards the Elephant’s Eye fire look-out before joining the cycle track leading towards Blackburn Ravine. The recovery group followed the shortcut towards Elephant's Eye along the gravel path. 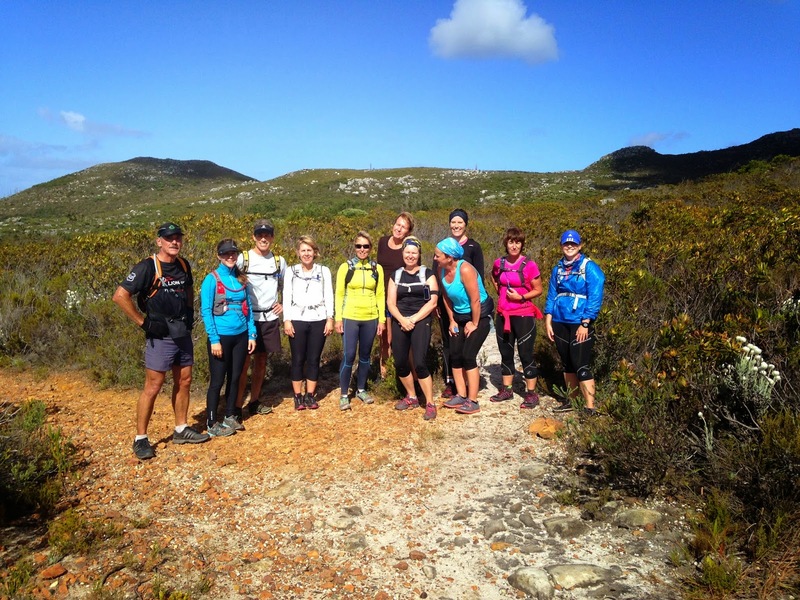 Both groups entered the single track to the Crassula path. 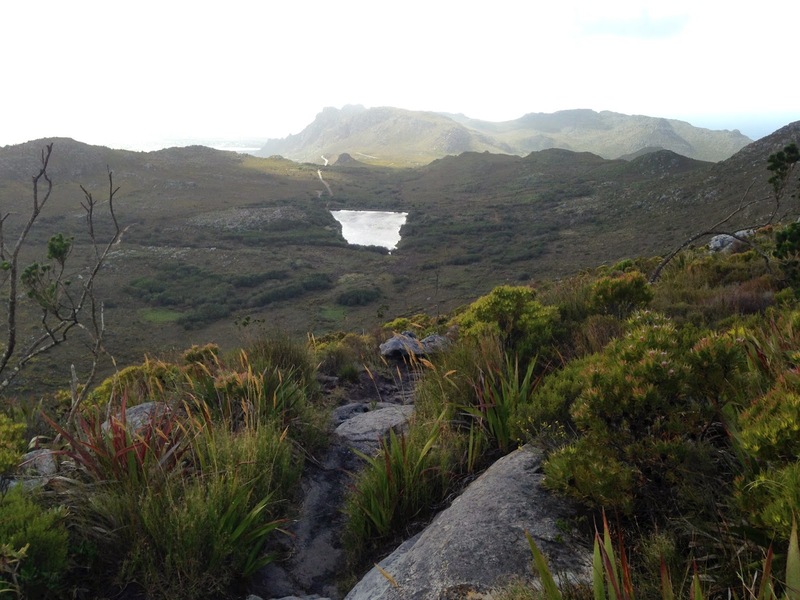 This single track provided beautiful views of the dam and tall fynbos plants that can tower over you. 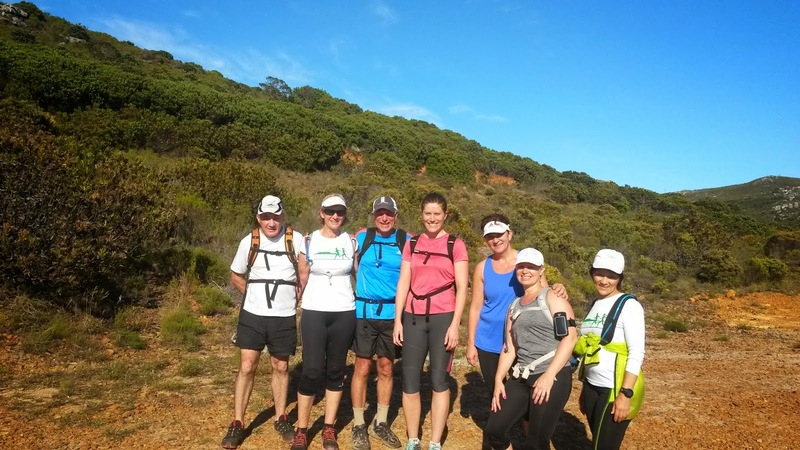 Finally at the bottom of the Crassula path, the Main and Recovery groups met before turning right onto the Jeep track and again right onto the stony single track on Steenberg plateau. This gravel path lead us back to the car park. The Walking group covered 9 km in 1h 45, and the Main group covered 11 km and the Recovery group covered 10 km in just under 2h. A smallish group of runners arrived at Sunbird Centre on Saturday morning, 9 in the main group and 8 in the recovery group. 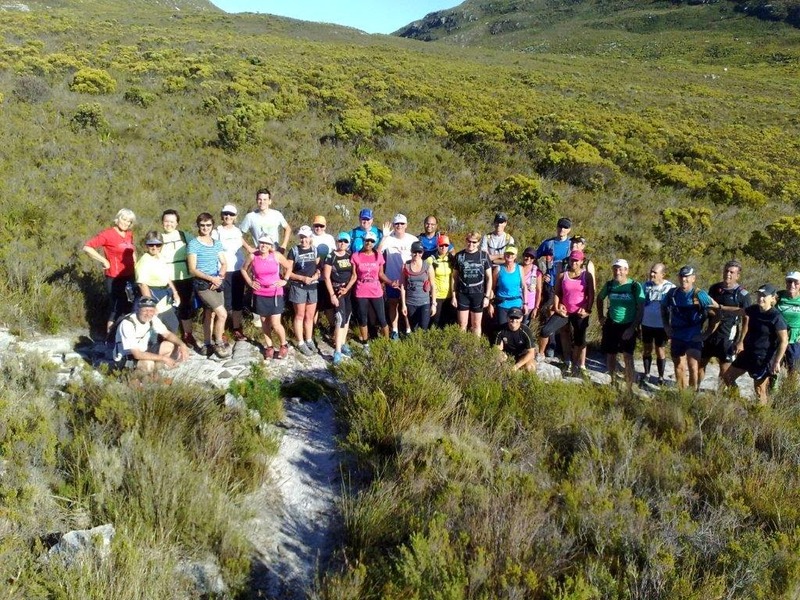 All runners set off from the Sunbird Centre, first downhill and flat before heading up through the Silvermine Valley via a zig zagging path. At the T-junction, both groups headed north (towards gate 2). 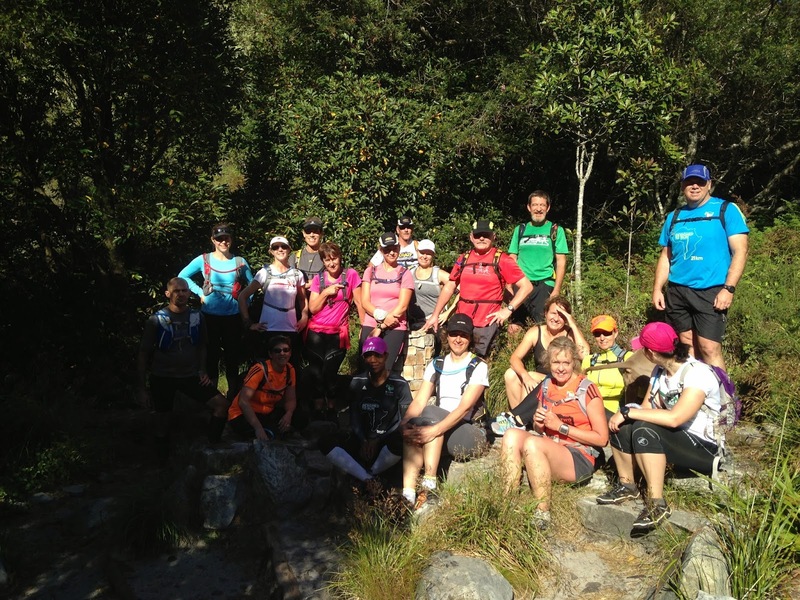 Here the Recovery group headed towards the waterfall and the Main group did an extra loop before exiting at Silvermine gate 2. 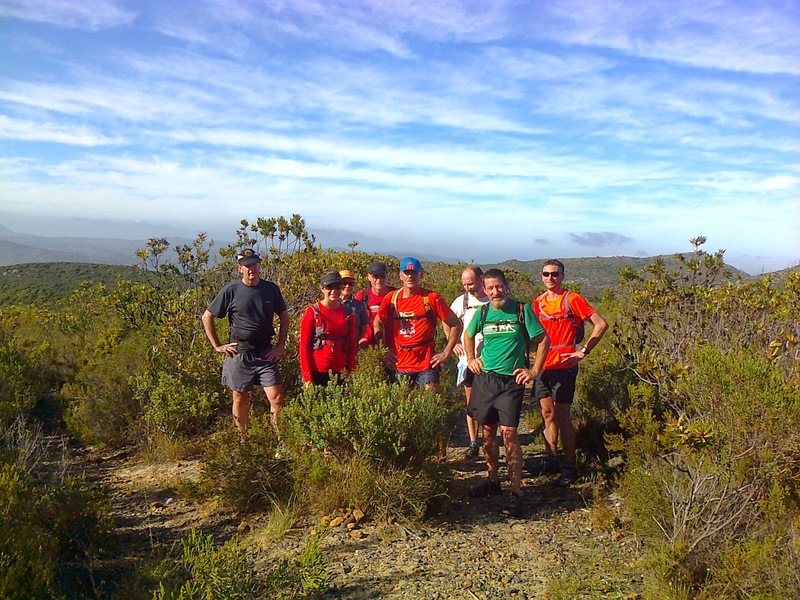 Both groups crossed Ou Kaapse Weg for the second half of the run. The Main group did an extra circular loop and the Recovery group headed south via the Old Wagon road. The Main and Recovery groups met on the Old Wagon road and headed back to the start. The Main group covered 14 km and the Recovery group covered 11 km both in 2 hrs. 21 trail enthusiasts started out at 06:30 at the Constantia Nek parking lot with a slight cold wind to get us started. All three groups set off from the Constantia Nek car park with a steady uphill on the single track. The Walking group went as far as the 'Bailiff cottage' before turning around and the Main and Recovery groups continued along the Smuts track. The Recovery group went up Ash Valley to Hely-Hutchinson reservoir before heading down the top of Skeleton's Gorge back to Smuts track. The Main followed Smuts track to the top of Nursery Ravine, where they turned left to the Hely-Hutchinson reservoir. 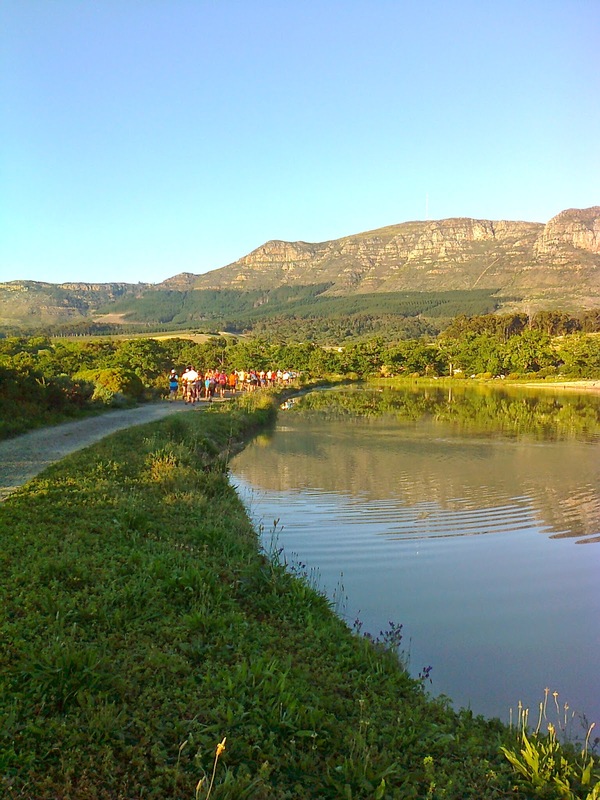 They crossed the reservoir wall and headed onto the track that leads to the aqueduct and then joined Smuts track and met up with the Recovery group. From here the Main and Recovery groups followed Smuts track back to the 'Bailiffs cottage' and back down to the parking lot. Main group route and elevation. Main and Recovery groups at the top of Skeleton's Gorge. In just under 3 hours, the Main group completed 12.5 km, the Recovery group 11 km and the walking group 7.5 km. Recovery group at the top of Ash Valley. Main group in front of the dam wall. Main group outside the Water works museum. This Saturday's run saw us starting head-on into a howling black South Easter. (Who's idea was this anyway?!) Garmin connect recorded a wind of 26 kph, SE, for the morning. From the lighthouse all groups headed up to the old military installation at the top of Slang Kop. From there the route carried on along the top of the ridge until the Ocean View road. Across the road and past the reservoir we turned right up the hill and proceed up through the Red Hill reserve. At a T-junction the Main and Recovery groups turned right and followed the track to the dam. The brave main group carried on round the dam. The first 8kms were tough going trying to keep our balance as the gusts threatened to throw us off course. We kept waiting to hit that 'calm patch' where we could gather ourselves towards ourselves, but that was nowhere to be found! But we bravely soldiered on knowing that soon the wind would be behind us. Some of us were attacked by the vicious thorn bushes at a particularly overgrown section of the route. A few runners from the main group turned back at the dam, whilst the rest continued about half way around it before heading back. We flew back with the wind literally in our sails - what a difference! We passed the recovery group on the way back, with most of us returning more or less at the same time. Peter did a lovely (more sensible!) walk along a section of our route and returning along the coastline. Main group did 16.6kms in about 2h30mins, recovery group did about 15kms. Thanks everyone for a great run! Saturday's run turned out to be a stunning day with no clouds to provide excellent views from the top. We had a great turn out, with all three groups enjoying their morning. 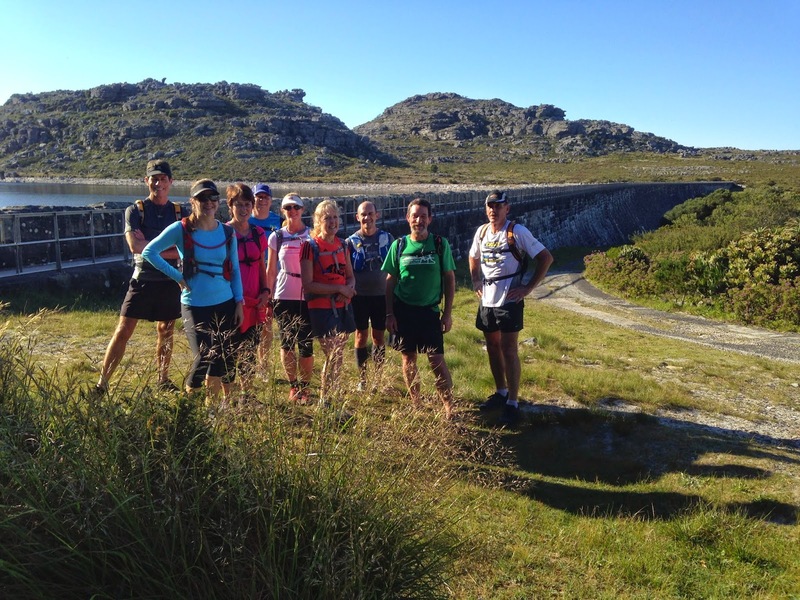 The main and recovery groups left the entrance of Silvermine Gate 1 and continued along the the river walk towards the mountain bike parking area, where the walking group started. The run along the river provided some much needed shade on this particularly hot Saturday. 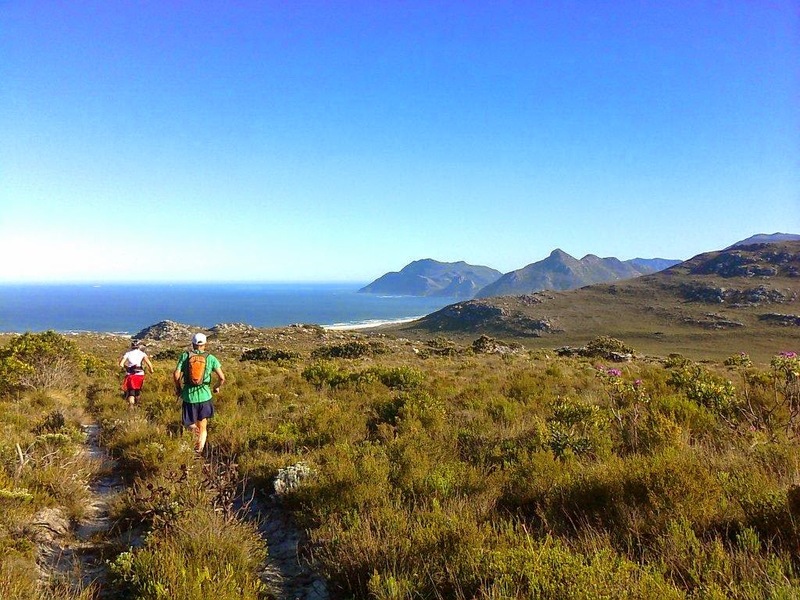 The route led along Steenberg Ridge and across to the Elephant’s Eye fire look-out, then towards Blackburn Ravine followed by the Panorama path to Noordhoek peak. All the groups met up at the lookout over Hout Bay. 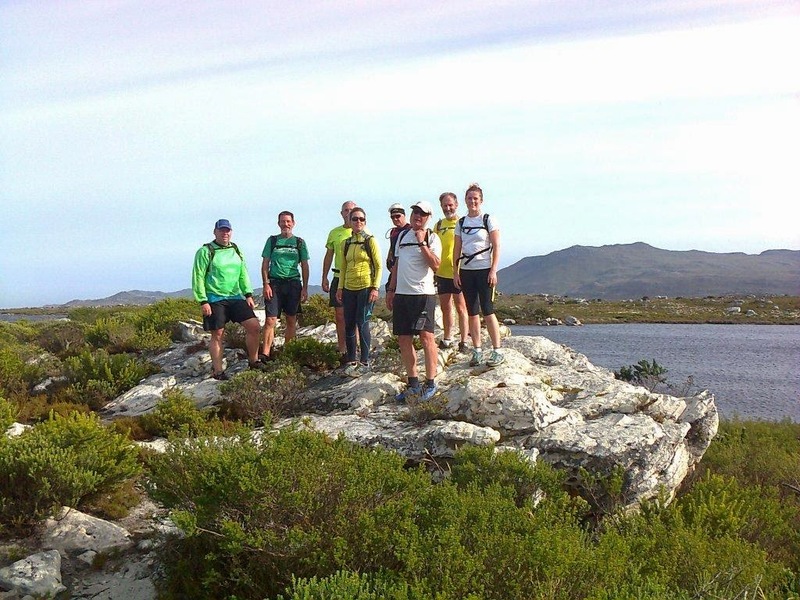 The main group continued up, up and further up towards Noordhoek Peak and returned via the Amphitheatre path to the dam and back down the river walk. The recovery group turned back, passed the dam and returned via the river walk. The walkers also returned to the mountain bike parking lot. The main group covered a gruelling 14km in 2h 45min, the recovery 10.7km in 2h 10min and the walkers 7.5km in 1h 50min. 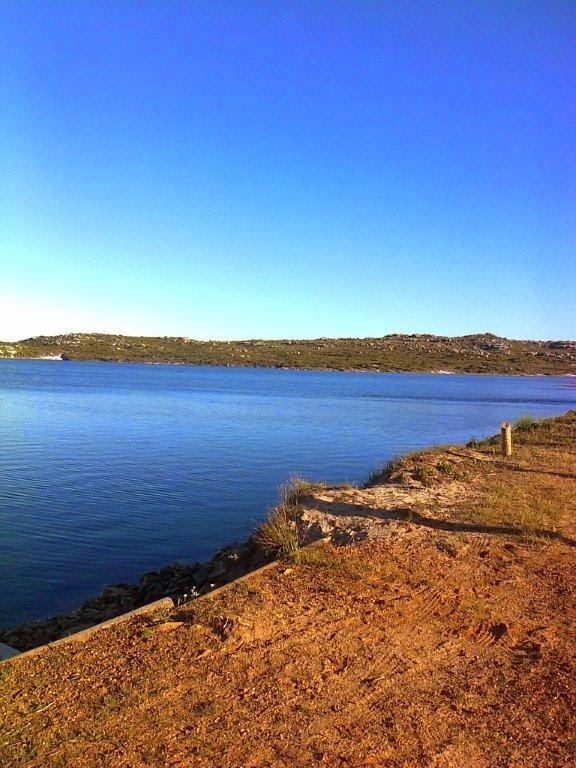 Nothing beats a swim in the dam after a long run. Shoes and all! 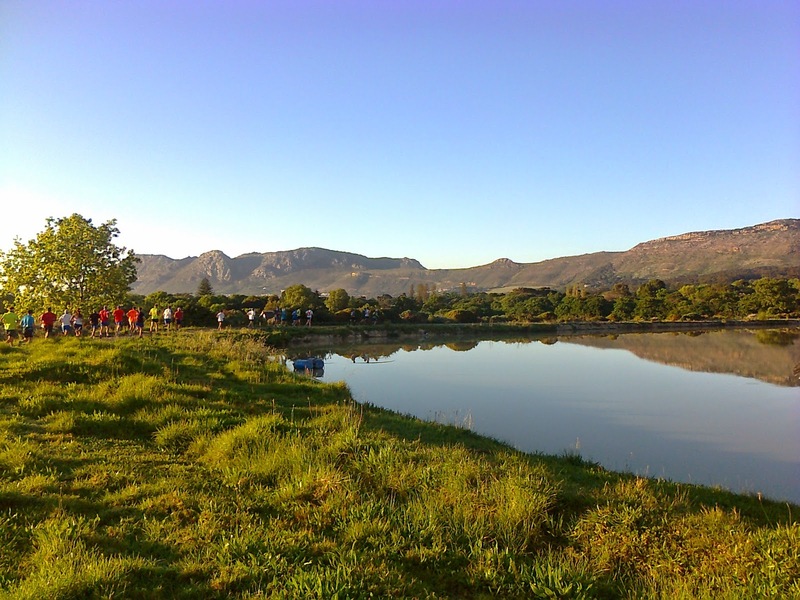 This Saturday we ran the reverse of the Kleinplaas dam circuit, which saw the runners reaching the small dam first. 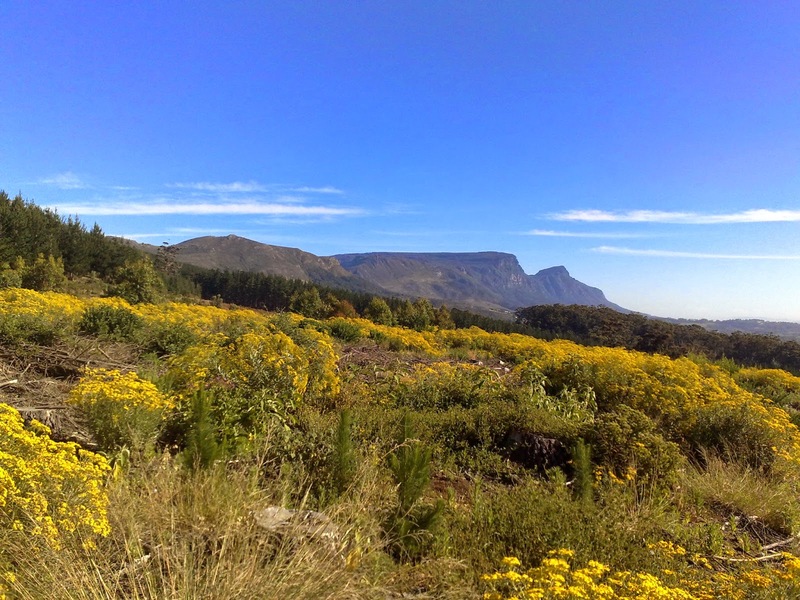 The circular route started along the ‘Puffer’ route to the Lewis Gay dam, around the koppies behind Glencain and Red Hill to the Kleinplaas dam, followed by the sandy path from Ocean View back to the start. The main group covered 13.78 km in 1 h 56 min.